The Boise program is among a growing number of trust-building efforts being developed by communities across the United States to deepen relationships between police and diverse residents. 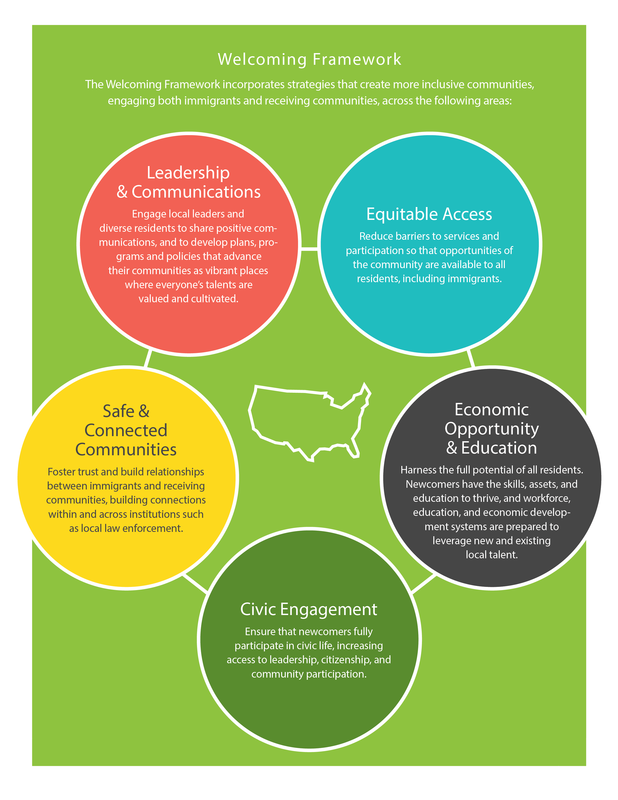 It’s one tactic to achieve a safe and connected community, which is an important part of a Welcoming Framework. Boise’s model offers lessons and opportunities that reach beyond its borders. Many refugees have little frame of reference for law enforcement based on consistent enforcement of laws, due process, and protection of rights. Laws we may take for granted are new to many new Americans, who may come from communities where corruption, violence, domestic abuse, and theft are ignored by authorities. Refugees may be reluctant to report victimization, and abusers may exploit their lack of knowledge about legal rights. The Boise program provides education about laws, customs, culture, and practices that are all new to refugees, giving them opportunities to be connected to resources for how their new community functions so they can actively participate. Officer Robinson wears plain clothes in his daily interactions, not a uniform, as a further way to reduce anxiety and build trust with new residents. “We want refugees to feel a part of their community and know that the community welcomes them,” said Officer Robinson. New Americans have the opportunity to grow to trust him, and by extension, the Boise Police Department. Views are shifting as they come to understand that police are there to protect all residents and ensure justice. To educate the broader community about their new neighbors, he speaks at meetings for local groups about how refugees came to Boise and offers opportunities to welcome and help them. Officer Robinson believes that these efforts strongly contribute to Boise being a cohesive community. An eight-year-old Iraqi girl in Boise faced trauma and fear when her parents were involved in a car crash and taken from her to the hospital. In the girl’s eyes, the government had kidnapped her parents. She began having nightmares and reliving traumatic experiences; she wasn’t making friends and was struggling in school. Her caseworker reached out to Officer Robinson, who planned a visit to the police station. “The girl and her parents met us at the police station; they turned on the flashing lights in my vehicle, played with a drug sniffing canine, and interacted with diverse officers. We had milk and cookies and everyone just sat around talking for 30 minutes. She greatly benefited from this visit, and it made an impact on her parents too,” said Officer Robinson. “It was an ‘ah-ha’ moment; at the end of the day, I knew the world was a little better of a place,” said Officer Robinson. The department has done a handful of visits for other refugee children since then, a tactic that has greatly increased goodwill and understanding. This community policing and trust-building effort helps develop positive relationships, improve reporting of crimes and proactively prevent crime. New Americans are more likely to report a crime taking place because the program has helped them to understand their legal rights and because the police department takes culture into account when administering justice. They work with the prosecutor’s office to see if any other options exist beyond jail, such as a fine or anger management classes, which can help change someone’s perspective. When someone tells him of a resident who seems angry or frustrated, Officer Robinson may visit their residence and try to help - connecting them with parenting classes, a financial management counselor, or other community resource - to get them through a hard time. Read more about trust-building police programs in Boise, Nashville, Indianapolis, and Atlanta.